Dave was born in Charleston, Illinois but was transplanted to Miami at the age of two months. Growing up a block away from Biscayne Bay, he began fishing shallow waters at the age of five. By the time he was twelve, Dave, accompanied by his younger brother, Steve, and a friend or two explored all areas of Florida Bay from one end to the other in their fourteen foot Challenger. Dave’s father became a founding member of the South Dade Anglers Fishing Club in 1969 and that was where Dave first learned the rewards of sport fishing. While fishing with his father and friends, he learned Florida Bay and Biscayne Bay and has been fishing these waters, as well as the lower Keys, extensively since the late sixties. Dave won numerous awards in the fishing club and began fishing more demanding tournaments. Fishing the Miami Metropolitan Tournament, he was awarded Tarpon Release Master,Inshore Grand Champion and many other titles over the years. 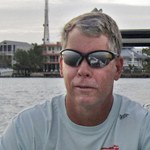 Before becoming a licensed captain and pro fishing guide, he guided his wife Linda to Un-Guided Met Master Angler three years, Inshore Grand Champion and various other MET awards in the eighties and nineties. 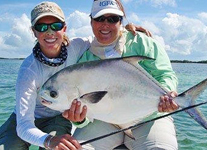 Linda is a prominent figure in the Keys fishing community, a tremendous cheerleader for Dave (known as Denk or Denkert to his friends) and his anglers. Linda’s Facebook page is a great place to keep up with goings on in the Keys. She also manages Denk’s Journal on this site. They are a fishing family! Dave and Linda’s daughter, Brooke, now age twenty-six, literally grew up on the water. He guided her to many tournament championships and exposed her to the camaraderie of the fishing community and the intricacies of shallow water ecosystems. She has turned Dave’s casual lessons into a couple of degrees and a career in estuarine sciences. Denk is fluent in fly, spin and bait casting, allowing him to effectively teach his customers how to catch fish. After working twenty-five years in the corporate world, he decided he wanted to live out his childhood dream and become a fishing guide. He currently lives in Islamorada and has been since 2003. He earned the friendship of the greats and fishes with Stu Apte, Chico Fernandez, Flip Pallot, Joan Wulff and Jose Wejebe to name a few. He fishes from Biscayne Bay to Key West and Everglades National Park. He trailers his boats to all locations but normally launches from the Lorelei, located in Islamorada at Mile Marker 82. Not only is he an excellent backcountry guide and gentlemen, he has been fishing the Florida Keys for more than 30 years and has become a true student of its environment. I highly recommend him.